A small tree to 40 feet, often low-forking or multi-trunked, with an open, oval crown. Notable for its muscular or fluted trunk and branches. Rocky and dry sites in Central and South Texas, west to Brewster county. 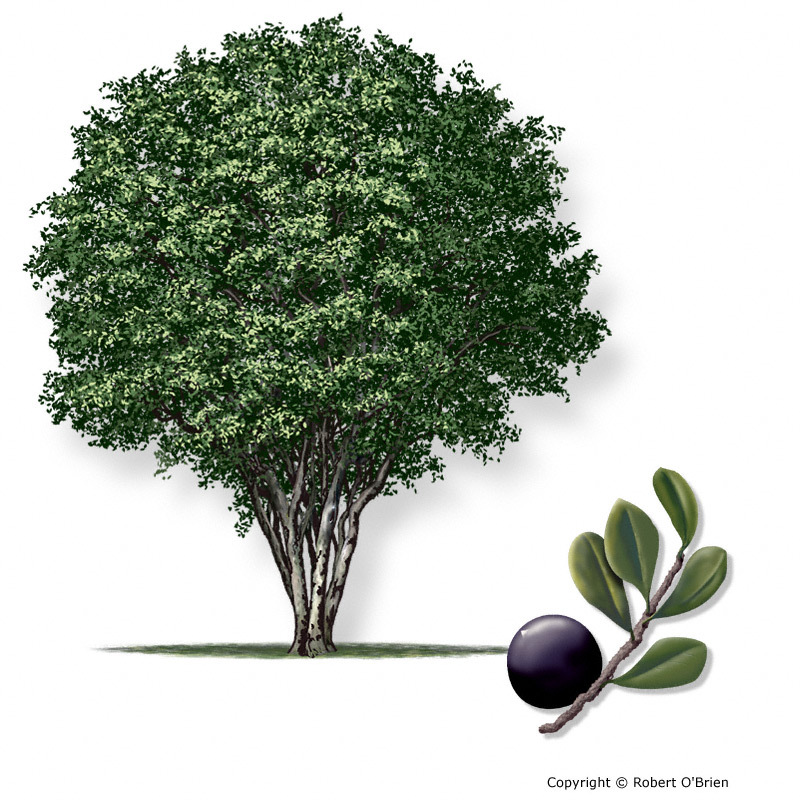 Requires well drained soils and has gained favor as a landscape tree from Austin to Houston. Simple, alternate, with almost no petiole, 1" to 2" long, obovate, thick and leathery, pubescent underneath; leaf edge without teeth, sometimes rolled under during droughts. Male and female flowers on separate trees. Male flowers inconspicuous; female flowers small, white, five-petaled, appearing in spring and attracting many insects. A sweet, round fruit, 1" across and slightly depressed at the tip, black when ripe. Favored by wildlife and edible by humans. Smooth, gray, and tight, developing olive or light brown patches that peel away to show the lighter bark beneath. Wood is heavy and very dark, with pale sapwood. Uses include tools and turning blocks; the fruit has been used to make a black dye. Common persimmon (Diospyros virginiana) is a medium to large tree with dark, blocky bark and large, edible fruits in the fall. Common crapemyrtle (Lagerstroemia indica) has smooth, muscular trunks and branches with peeling bark. Wood is suitable for making salt shakers because it absorbs moisture.